Description: Charming well maintained 3 bedroom cutie! 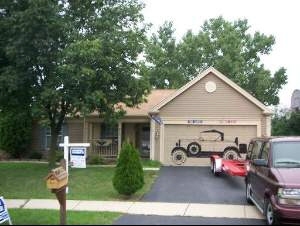 Boasting master bath, large master, large living area & huge private fenced yard in cul-de-sac! Newer roof & furnace! Wonderful deck! Spacious living w/awesome floor plan! Light & airy with cathedral ceiling & patio door to great yard! Pergo type flooring in kitchen & 6 panel doors enhance this home's style!